As competition accelerates due to the increasing pace of new developments and the continually growing number of competitors, the delimitation and unique positioning is of essential importance for fashion companies. 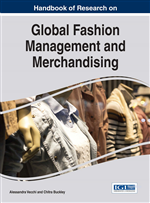 Therefore, it is this chapter's purpose to develop a segmentation frame aligned for the luxury fashion industry, which categorizes it into distinct segments according to determined criteria. Hereby, the author emphasizes established criteria (e.g. brand loyalty, exclusivity) and current industry trends (e.g. fast fashion) in order to develop a ‘luxury fashion segmentation cube', dividing the industry into four specific segments (premium, high-end, prêt-à-porter, haute couture). The objective of this chapter is twofold: With the segmentation cube, a tool for analyzing the competitive situation within the respective segments is developed. Further, it is applied to provide insights on the required actions for obtaining a holistically oriented organizational positioning strategy within the desired segment. Concluding, theoretical and practical implications are highlighted. In recent decades, there has been an ongoing increase in demand for luxury products, which has led to a continuous overall upturn in the significance of the luxury industry worldwide (e.g., Hoffmann & Coste-Manière, 2012; Jackson, 2004; Ricca & Robins, 2012; Shukla & Purani, 2010; Wiedmann & Hennigs, 2012). Reasons for the steady increase in demand may be found in various changes that have occurred over this time: first, the shift towards improved accessibility to a higher level of education for a growing section of the population as well as changes in family structures (e.g., regarding the role of women in the family) have had an effect on the overall economic wealth and prosperity. Second, market conditions have changed significantly: whereas formerly only a small number of selected companies were able to operate within the luxury segment, market entry barriers have diminished over time, resulting in a higher level of market penetration and a higher degree of market competition (Brewer, 1998; Silverstein & Fiske, 2003). Still, the luxury business, which nowadays represents one of the most influential industries worldwide, is considered to be very difficult to enter due to the aforementioned increasing level of competition (e.g., Aiello et al., 2009; Fionda & Moore, 2009; Hoffmann & Coste-Manière, 2012). Looking back, the understanding of the term ‘luxury’ as well as customers’ perception of what is considered luxury has been subject to change, shifting at various times in the past (Coste-Manière, Panchout, & Molas, 2012; Sekora, 1977). However, the pace of change has reached a new high level within the past twenty years, beginning in the middle of the 1990s: this current fast development is predominantly based on the fast-changing market environment, dominated by trends and new streams of style, the constant alteration of a company’s business model due to varying market conditions, and the change of the luxury customer from a niche audience to a broader target group. The sum of these current developments affects the understanding of what is generally considered to constitute luxury nowadays. The fact that luxury can be explained on the basis of different characteristics (including both cultural and individual aspects) still leads to different individual opinions on what the category constitutes (Dubois & Paternault, 1995). Still, it is uniformly agreed that the term luxury itself is predominantly associated with trend-related branches of the economy, meaning all branches focusing on fashion aspects (e.g., often implicated with design). These trend-related branches are usually highly influenced by current developments in their respective market (Hilton, Choi, & Chen, 2004), which makes them subject to constant change. Even though a relationship to trends can be identified in various sectors, for instance the automotive, cosmetics, leather goods, and clothing industries (Sproles, 1981), it is strongest in the fashion industry. Accordingly, this explains the extraordinarily strong correlation between luxury and the fashion industry since these two sectors have grown very close within the past decade (Jackson, 2004). This close connection basically takes root in the fact that luxury, in its fundamental sense, is a symbol of intrinsic differentiation (Perrot, 1996); likewise, the individual’s search for differentiation is considered to be the main impulse underlying fashion, which consequently is influencing the social formation of groups based on style (Simmel, 1981, 1991). Especially, the customer’s acceptance of trend-oriented fashion innovations is highly influenced by the need for individuality (Park, 1997). Thus, the combination of luxury and fashion addresses the aspect of the search for individuality at its peak and promises a stronger possibility for differentiation than for luxury goods in any other industry. Consumer Goods Sector: An industry market developing products purchased by individual customers rather than industrial producers. Within these goods, there is differentiation between commodities (e.g., automobiles, electronics) and convenience goods (e.g., food, beverages). Trend-Related Branches: All branches focusing on the aspect of fashion, displaying a trend-based orientation of the company. Usually, these industries (e.g., cosmetics, leather goods, clothing) are highly influenced by current trends and developments on the market. Luxury Industry: A constantly growing market located at the upper part (near the top) of the scale, focusing on products which are not necessary, but pleasant and satisfying to possess. Often, a certain level of social status is associated with the possession of luxury products, focusing on a high level of exclusivity. Luxury Segments: Single divisions of the luxury industry, classified by level of exclusivity, price and accessibility. Within the luxury fashion industry, the common classification of segments involves premium, high-end, prêt-à-porter, and haute couture; in addition, some classifications include the segment ready-to-wear, while premium is not considered as luxury in some classifications. Fast Fashion: Term to express the fast speed by which new collections are developed and launched within the fashion industry. In this connection, fast fashion is based on the quick realization and catch-up of current trends and market developments in fashion products. Intra-Industry Analysis: The investigation of factors based within one industry, not comparing to other industry’s factors. In theory, three distinct approaches of an intra-industry analysis are prevalent: strategic groups, competitor analysis and market segmentation analysis. Market Segmentation: The approach of dividing a holistic market into specific segments according to determined criteria. Diverse forms of market segmentation are distinguished, either segmenting according to customers (e.g., geographic location or demographic characteristics), to companies or to industries.